Now that it's back to school time there is a lot of focus on kids getting to school safely. At Mølholms School in the town of Vejle there is a unique solution on the roads. A 3D warning sign that looks - to motorists - like it's thick and lying in the middle of the road. You can see a very brief video about it here at TV2 News. It's in Danish but it's all about the images, innit. It isn't easy getting permission to put up such warning signs on roads or bike lanes. I've investigated the possibilites before, because of some ideas I have about behavourial campaigns or warning signage for cars when approaching bike lanes or sidewalks. 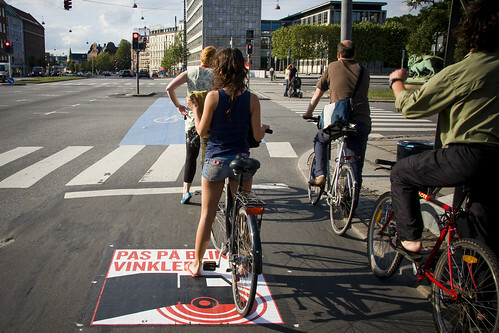 Instead of ridiculous car-centric campaigns like this one in Copenhagen. I've blogged this photo before, above, but the journey from idea to implementation was long according to colleagues. There was the question of whether signage on the bike lane would be 'dangerous' because it would cause people to lose focus whilst cycling. It was eventually approved and it's used in various forms. The stickers above warn about right-turning vehicles. They are easy to apply and easily removed when the campaign is finished. In related news, police are out in force at the moment because of school starting, happily ticketing parents who break the traffic laws when dropping off kids at school in cars. Nice to have a little focus on the bull for a change.